1980-1983. In San Francisco during the late 70's, the musical scene was very intense and underground. Among the bands which brought powerpop to the punk scene were The Rockers (see entry). In 1980, after a self-released 7" EP, the band (minus guitarist Carl Jeppesen with the addition of a new bassist Jon SanFilippo and later a second guitarist, Mark Newcomb) changed its name and became The Finders. 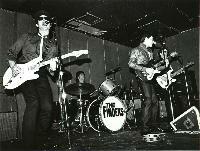 It seems that The Finders were a very popular act in San Francisco. Their material was very similar to The Rockers, maybe with a bigger sound. Two singles were their sole available output at the time, even if the band actually spent time in the studio on recording an entire LP (involving ex-Move manager Tony Secunda, as producer). In fact, these sessions were riddled with problems, and as you can guess it, the album masters never saw the light of day, being derelict in some studio closet until recently. Fortunately, Phil Schraub managed to pick up the masters and with the help of his brother Dennis and John "Rock" Perga, they have revitalized their own Squid Music label (the Finders publishing home). Their "great lost album" (the two singles plus 8 unreleased tracks) can now be heard for the first time thanks to a CD release. Squid Music has also put out two additional Finders CDs, the former including live performance and the latter demo material. 7" « Calling Dr. Howard » b/w « Bad Food » (USA [Alcatraz #Z3] 1982) Because the original sleeve featured member John Rock vomiting over a toilet holding a telephone with a picture of the Three Stooges in the background, and after Columbia Pictures threatened them with lawsuits if they didn't change the cover, this 7" was released with 3 different sleeves (two on the Sky-Fi label). "Calling Dr. Howard" gave the band some media coverage with eventually a video on MTV. scheduled in 120 minutes rotation on MTV. CD « DEMOS » (USA [ Squid Music ] ) As much as I dig the "Long Lost Sessions" CD, this collection of demos -- recorded prior to the addition of Mark Newcomb to the band -- is THE stuff. Okay, the sound is muffled and rough (not that much anyway), but some tracks that appear nowhere else are outstanding : "Hold Tight","It All Works Out","Summer Love","On And Off","Standing In The Rain","The Way It Goes". The production is more pop, more `60s oriented maybe. Some early versions here are even better ("Ain't no use in tring"). Essential : pick up the Rockers, the "Long Lost Sessions" and the Demos CDs and you'll have a oh-so-ah enjoyable slice of vintage 1980 powerpop. LP « SHAKE SOME ACTION » (Fra [Philips #6370-804] 1976) The Lp was actually out earlier in the year in France, curiously known as having a "thinner" sound than the later UK and US pressing. Among the tracks performed here, "I Saw Her" was borrowed from the Charlatans' unissued material. You could hear in tracks like "I Can't Hide" a kind of reverbered sound which almost gave the band a psychedelic touch, bringing to mind Dave Hassinger's productions for The Electric Prunes... or the Aftermath-era Stones of course! LP « NOW » (UK [Sire/Wea #SRK-7059] 1978) I have to mention this UK release because it was a revised issue which included two GREAT additional tracks : "When I heard Your Name" (recorded in 1973) and a cover of "Blue Turns To Grey". EP 12" « The Goldstar Tapes » : b/w (Fra [Skydog #SKI 224] 1983) The Flamin' Groovies wanted Phil Spector to produce them so they met with him ; they started recording at Goldstar, hoping he would show up. He never did. They were also going to employ Darlene Love as guest vocalist, but with little to no money available, they weren't able to entice her. The goldstar sessions degenerated into a mixture of unpaid studio bills, inter-band fights and nasal gratification induced bad vibes. Some of the near completed tracks have since surfaced on this LP including "River Deep, Mountain High", "Do I Love You", "And Your Bird Can Sing".... The tracks were mastered from cassette as the studio wasn't paid.[robin]. The Flashcubes were a great, kind of cult band from Syracuse, NY. The main songwriter/singer, Gary Frenay had a real knack for ultra catchy chorus, with a pronounced Rasperries-esque obsession while vocal-wise, he could remind the experienced ear of Greg Kihn. Maybe the strong point lied in the fact that the Flaschubes had three musicians with strong personality : in addition to G. Frenay, the band could rely on Arty Lenin and Paul Armstrong, occasional writers but not devoid of talent. While Armstrong had already left for 1.4.5., the band changed his name circa 1980 to Screen Test. The band only had two singles and eventually in 1997 a long-awaited compilation entitled "Bright Lights" with a lot of unreleased tracks. You can read the complete band history in the booklet. One more reason to get it. EP 7" « Christy Girl » b/w « Guernica »« Got No Mind » (USA [Northside] 8/1978) great A-side! CD « BRIGHT LIGHTS » (USA [Northside Records #NS503] 1977-1980,1994,1993) Very very welcome CD compilation of unreleased material with 7" single tracks. Includes what would have been Flashcubes' third single "No Promise" b/w "She's Not The Girl", maybe their best songs ever. With -- among other things -- a perfect sound, this CD might appeal to pop fans who usually only care for more recent stuff. Hailing from Springfield, Missouri, McCoy, Frink, Dwyer and Coffman started out Fools Face in 1974. These bandmates confessed that the early sound of the band was more geared towards Genesis' style of pop "with a lot less energy" than they had later and that "the songs tended to be slower, more plodding, more involved". However that might be, they eventually got revitalized with the `77 punk wave, harking back to pop and the likes of The Raspberries. Around this time, Wirt, formely with Rudy and the Razors which was the "closest thing to a straight punk Springfield has ever seen", joined the group and give its definitive way. The band had a local big following with a "reputation of a hot live band". Undeniably the strength of the band turned out to have four fine songwriters and as much vocalists, everybody (except drummer T. Dwyer) -- at a given time -- having made handsome contributions to the best album tracks ... but also to their quirkiest moments. The GO were a group out of Yonkers, NY. The band basically began as a cover band but decided there was no enjoyment in that, so began writing and recording their own material, playing the NY/NJ club circuit at the height of the "punk/new wave" era with several CBGB appearances. Through a chance coincidence, some early 4 track recordings caught the ear of producer Rob Freeman (who had engineered the debut LPs of the Ramones, Blondie & Robert Gordon). Rob worked with the band to develop some of the writing skills and then agree to produce the 4 song ep on the band's own label for Tidal Wave Productions. Followed a creative period with 40 or so songs that were recorded in Ken's house on a teac 4 track recorder. Lack of commercial recording success and feeling somewhat leery of the impending "new romantic /synthesiser" sound, The GO broke up in 1982. Featured Bob Kozak, formerly in The Jumpers. [Danny Wilde (vocal/guitar),Richard Sanford (drums), Philip Solem (guitar/vocals), and Ian Ainsworth (bass/keyboard/vocals)] Wilde went on to release on solo album for Geffen before teaming up again with Solem to form the Rembrandts in 1990. EP 12" « BANNED IN AMERICA » : b/w (USA [Ear #882,] 1982) ?